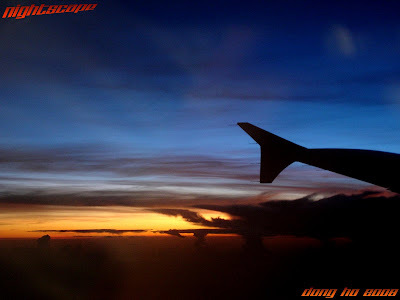 flying at dawn is my personal choice because other than being cheaper, it usually gives me the chance interact with people waiting for the earliest flight of the day. they are usually overseas Filipino contract workers going home to their province. when i arrived at the centennial airport i decided to read a magazine and take a nap instead to save some energy. i brought with me "abugee" who has been traveling with me for 4years now. it is named after our favorite cat who died when i was 10years old. NAIA terminal 2 opens at 2:00am. it also called the Centennial airport built in commemoration of the celebration of the 100th year of Philippine Independence. i like this airport because of its stable operating system and its new facilities. traveling with Asia's first commercial airline, the Philippine Airlines, is a plus. but i also traveled with Cebu Pacific Air and Air Philippines several times. we boarded the plane at 4:05am as it left Manila by 4:30am bounded for Cebu. 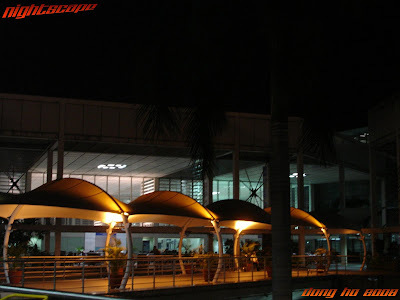 it's just an hour flight to the Mactan-Cebu Internaional Airport. what's best when traveling at dawn is the sunrise view from the plane. psst...asan na yung combo no.3 ko at yung danggit namin ni kingdaddyrich?? syanga pala inubos namin yung tsokolate ng ref mo nung wala ka..lols..
hi doc, hahaha... dala ko naman yung mga chocolates sa Cebu. yung mga naiwan ay mga a day before its expiration. hahaha... no problem. the photos will be posted day by day. yung pasalubong. eto ready na. uy dom, glad to hear you're back. how's the queen city of the south? nice to know you're back Dong! i also prefer traveling before the break of dawn. i usually take the bus from LB to Diliman at 3am, the buses are not usually crowded. we tend to experience and witness some wonderful things which we don't usually get when we travel during the day. nice documentation of your trip. will be on the lookout to see more. cheers! welcome back dom! musta ang cebu? 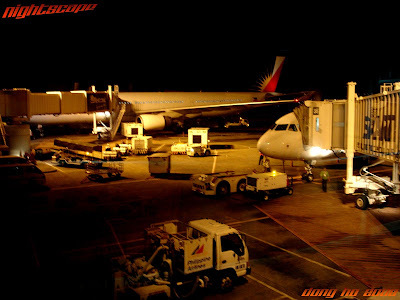 As much as possible I want to travel via Philippine Airlines because of the airport. I really don't like the old domestic airport. oggie, ayos ang cebu. maraming improvement at daming construction. i will feature some of the escapades in the coming days. sarap nga talaga magbyahe sa umaga pati yung pila maayos. coffee break is perfect! hi rayts, yes. no traffic congestion and the travel time is normal. just keep in touch as i feature Cebu. erick, astig ang experience. i will be sharing it day to day here. kegler, it's also nice to be online again. same here. the old domestic airport has a small area to accomodate crowds of travelers. hehehe... welcome back ding dong! Beautiful photos! There is always excitement at an airport and a sense of being alone, even in the crowd. You captured the spirit beautifully! Wow, there you. I really love sunrise and sunset na kapag nakikita kong maganda, tumatakbo ako para mapanood ang pag rise or pag-set nito. Glad ure back! AM looking forward to see the pasalubong (pictures) here day by day. anw, gusto ko yung last foto.. byahe na rin ako next week. kaya lng daylight ang byahe ko.. pero pagbalik ko d2 sa UK, night til morning ang byahe, i hope maka kuha ako ng foto. Glad to see that you're back home safely. Can't wait to see more photos from your trip. That photo of the sunset just can't be beat. makikita ko na rin ang paliparan ng pinas soon! kingdaddyroch, hehehe... namnamin na lang ito. salamat sa pagbigay buhay sa blog ko habang akoy wala. thanks sandy. sometimes traveling alone gives you more chance to see your surroundings intricately. thanks redlan! i really appreciate your post considering my blog as one of your favorite. bw, i agree. i enjoy drinking coffee while flying. jasper, yes. nakabalik na ako. byahe ka na nga rin and siguradong excited ka na at excited din kami sa mga dadating mong post. share mo sa blog mo ang experience. hi karen, thanks! im also glad to be back and be able to blog hop. hi lyzius, uuwi ka pala. happy trip. wow! nice pics! ;) welcome home! i like the last picture the most! very nice view. the last time I rode a plane was going to Bohol last january. unfortunately it was very cloudy I didn't see much of the sky. tapos na pala pagliwaliw mo sa Cebu...hup u had a great time! waiting mur of ur photos..
hi wendy,thank you very much. sunrise and sunset while flying is also by chance. i was blessed to have such a view on my flight to cebu. dakilang islander, tapos na nga. balik maynila na. i really had a great time there. just keep in touch for the experience. I like the sunset shot, best time of the day (for me)... agaw dilim. Welcome back DonG! hi millie, thanks. it's also nice to get back online. i hope you get to have your own blog soon. Glad to know you're back home. Hope you had a wonderful vacation. Great shots at the airport especially the sunrise. wow. gusto kong pumunta ng cebu. nakakainggit! Great shots of the airport and of the morning sky. I hope I'll have the chance to visit Cebu one of these days. hi rachel, thanks! yes i'm already in manila but after a day i need to go to batangas. i really had a great time in cebu and batangas. hi vera, cebu is just an hour away from manila and you can always avail the airfare promos. panaderos, make sure that you'll visit cebu specially the island that i'm going to feature here. sarap naman bakasyon mo...konti nalang babakasyon na rin ako.. he he he. Question... how much does a trip to Cebu cost overall? I'm thinking of doing a team building there. >me mangyan, hahaha... ako bihirang matulog sa byahe unless mahabang mahaba. sarap bumyahe sa pinas kasi maganda tingnan ang mga island sa eroplano. 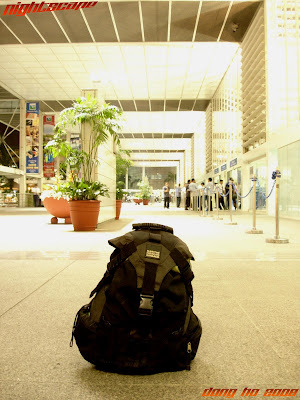 >peter, usually it ranges from P3000 - P4500 two way trip to cebu. it depends on the date. usually the earliest flights are the cheapest. >hi mimi, yes. masarap magbyahe pag dito sa airport na ito.